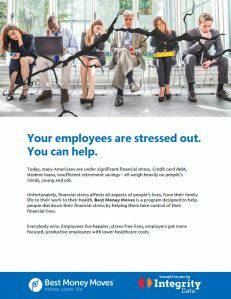 Your employees are financially stressed. We can help. Best Money Moves is a mobile-first service designed to help people measure financial stress and then dial it down in order to get control of their financial lives. The service is sold to employers who then offer it to their employees as a free employee benefit. Best Money Moves does not sell anything. There are no ads. And, there are no hidden tricks. The only goal is to help people make smarter moves with their money by providing award-winning information, easy-to-use tools, a point-based reward system, and a unique content-mapping system that solves financial problems quickly and easily. And for employers, less financially-stressed employees translates into a happier, healthier and more productive workforce. The Best Money Moves budget tool doesn’t just do the math for you. It tells you what your Best Money Move is so that you can quickly learn how to manage every dollar more effectively. All information in an employee’s dashboard is private. And, by that we mean, what you enter is never shared with your employer or anyone else. Your employer is only able to see the overall view of how financially stressed all of the employees are as a group, never individually. Promise! The Stressometer measures financial stress in 14 categories – because it’s never just one thing that’s causing problems. So, measure your financial stress and then dial it down with Best Money Moves’ unique content mapping system, that helps solve your biggest pain points, quickly, easily, and effectively. Best Money Moves features a point-based reward system that rewards you every time you log in, enter information into your profile, work with your budget, read articles and checklists, and measure your stress. Each point translates into a chance to win the next contest. Check your progress on the leaderboard! Financial information is stuffed with jargon. Know why? Because it’s in the financial services industry’s best interests to keep you confused. That way, you’ll rely on them for “helpful” information and are much more likely to buy whatever they push at you. Best Money Moves believes that you are perfectly capable of managing your money and explains the ins and outs of personal finance in a way that’s easy-to-understand and with, more importantly, easy-to-follow directions. If you use Best Money Moves, you’ll quickly see life-changing results! Money coaches - because technology isn't enough! Technology is great. Information that’s written in a clear, easy-to-understand way is extremely helpful. But, it isn’t enough. The latest research from the Consumer Financial Protection Bureau (CFPB) shows that adding personal financial coaching makes a positive, lasting difference to those coping with financial stress. 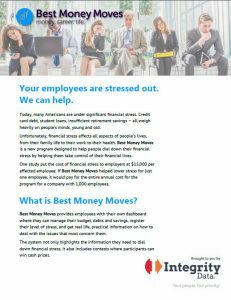 Best Money Moves offers employees access to their Money Coaches. These are trained, accredited professionals whose whole goal is to help you make smarter decisions with your money. 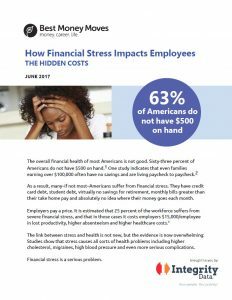 How financially stressed are your employees? If you’re a company owner, CEO, or HR professional, the level of workforce financial stress has wide-ranging implications, ranging from retention, engagement, and productivity, to health. Best Money Moves offers an innovative way to measure financial stress. Their Stressometer measures financial stress in 14 categories. The Employer Dashboard shows overall employee financial stress, and stress levels over time. In addition, the Employer Dashboard features information on program usage, debt and savings levels, and more. 63% of Americans are broke. They don’t even have $500 for emergencies. As an employer, this shouldn’t be your problem. But it is. Because 80% of your employees are suffering from moderate or severe financial stress. That means they miss more work, are less focused, engaged and productive than non-financially stressed colleagues, and have higher rates of turnover. But it doesn’t have to be that way. Best Money Moves is a different sort of financial wellness program. 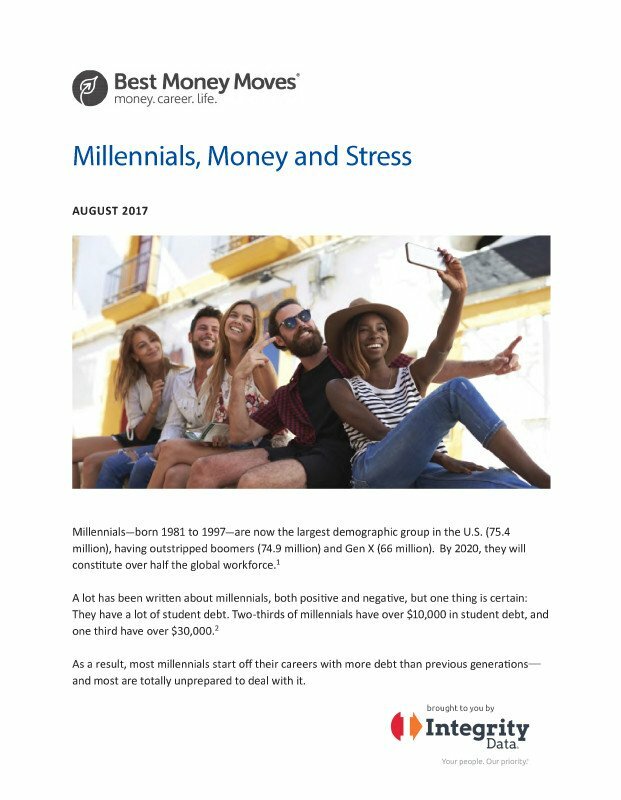 Led by award-winning financial writer, author, blogger and radio talk show host Ilyce Glink, Best Money Moves has built a mobile-first platform that measures employee financial stress, then dials it down with a unique content-mapping system that helps solve your employees’ pain points. What makes Best Money Moves different? Here’s the thing: Your employer may have a handful of great financial wellness programs. Your problem is you think you can’t afford to take advantage of them. Well, you can. If you are looking to have the best financial wellness programs that you can, ask your employer to offer Best Money Moves as part of your package of financial wellness employee benefits. Best Money Moves will not only help you figure out how to make ends meet – they will show you how to pay down your debt in the fastest way possible, balance your budget, save for retirement – and have a bit extra to treat yourself now and again. And if it all seems overwhelming, call their Money Coaches for free for some extra guidance and encouragement.